The performance lateral liner system is a one-of-a-kind, cured in-place process (CIPP) that allows for the liner to be placed anywhere in the pipe by inverting through a cleanout. The liner can be directed in place either upstream or downstream using the LMK® patented guide shoe. With LMK’s Lateral system, renewing lateral pipes is a simple no-dig process because the entire installation can be completed through a cleanout. Gasket sealing O-rings are placed either at the upstream or downstream ends of the liner pipe providing a verifiable, non-leaking lateral liner that is compatible with all types of piping. LMK’s lateral liners also feature compressible material at the upstream end of the liner, creating a smooth, tapered transition from the new pipe to the old one. This process renews laterals from 4 to 8 inches in diameter in continuous lengths up to 130 feet. Inversion tanks come in two sizes (18 inch or 36 inch) and are equipped with a camera port ensuring the liner can be visually inspected under pressure for proper placement before the liner is to be cured. Eliminates the need for an excavation pit! The simple system allows for installation from one open point, typically from an outside cleanout or an inside cleanout that is normally located in the basement of the home. The installer can determine the placement of the lining by where they position the liner within the bladder. Within a translucent bladder, or connected to a positioning hose, the lining is positioned. Then it’s assembly is inverted through the cleanout and conducted upstream or downstream with the help of a guide shoe. The liner does not commence inverting until it is inside the horizontal lateral pipe, therefore only the bladder is placed inside the cleanout at this point. Prior to curing, a lateral push camera will be be inserted within the translucent bladder, allowing a visual verification of the liner placement. The installation process includes the use of a camera port which allows a lateral push camera to be inserted inside the translucent bladder, giving visual verification of the liner placement prior to curing. The liner can be cured at normal temperatures or accelerated with steam. The liner can be installed where the inflation pressure is never compromised; because the liner remains inflated from the time of inversion through to the curing process. This is a crucial feature as the pressure used to invert the liner tube may move broken pieces of pipe. If inflation pressure was released, the broken pieces of pipe could fall on the deflated liner. Inflation, deflation and subsequent re-inflation could result in a defective liner which would result in required excavation to repair the defective liner. When cured, the bladder is re-inverted and retracted from the pipe. There is no cutting of the liner required because the liner starts below the test tee and past the side connections. Furthermore, the liner is open at both ends at the main location; there is no cutting at the upstream end or the downstream end. A similar process is presented from an outside cleanout. In this case, again the distance from the clean-out cap to a determined location is measured using a push camera with markings. The liner and bladder are assembled, resin saturation is performed and the liner is inverted in-place. The key is to begin the liner downstream or upstream of the cleanout vertical riser to allow for no cutting. Cutting not only requires time and money, it is also very difficult to achieve a full, smooth circular surface cut, especially from a 4-inch vertical pipe that dead heads into the lateral pipe. Previously, lateral linings were inserted from an excavation near the property line or near the house foundation. Excavation pits are messy, create higher costs through digging and restoration, more risk and take more time to repair the defective lateral pipe. This method for lining through a clean out, with no cutting required, eliminates the need for an excavation pit, reduces costs and additional laterals can be renewed in a day. Business owners, property owners and homeowners are happier because their property has not been torn apart and their sewer has been repaired in just a few hours. 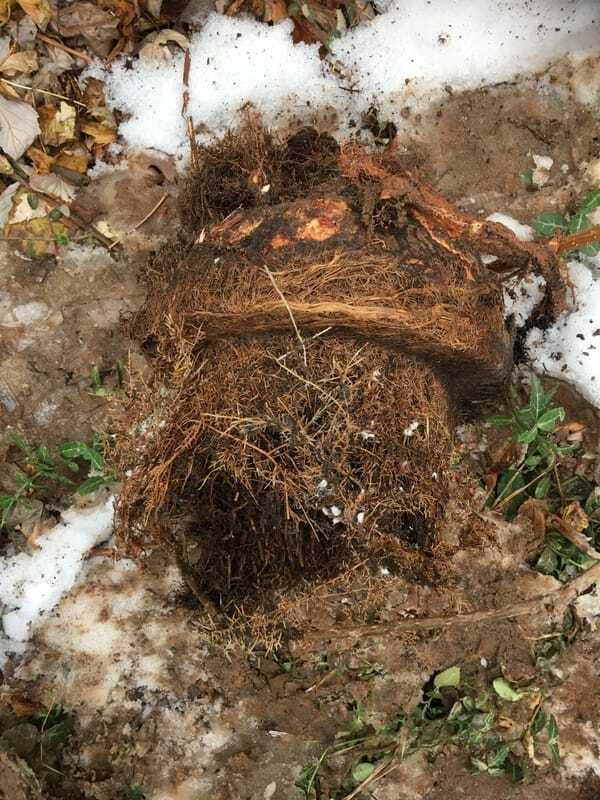 This is an example of tree roots in a pipe. The tree root penetrated the pipe so bad that Plugged Piper actually had to dig up the pipe to remove the tree root. 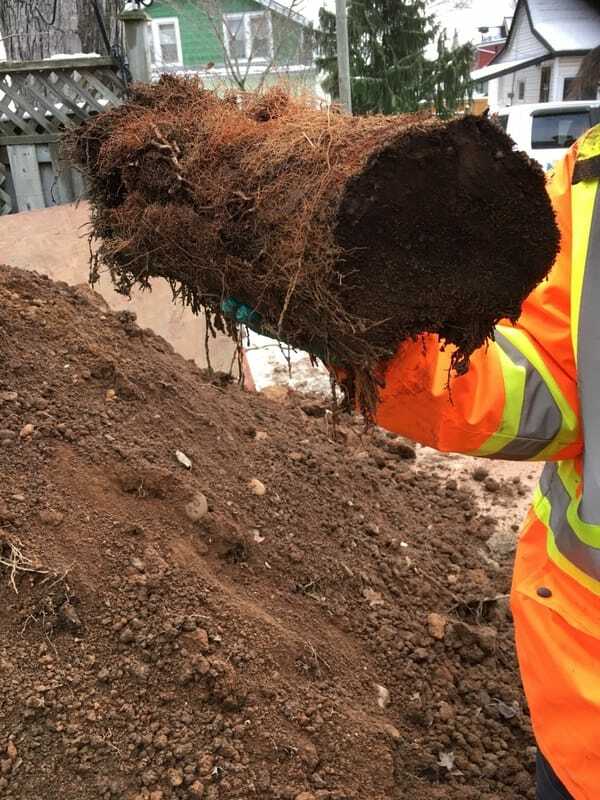 This goes to show that if a tree is left unattended, tree roots can block 100% of an underground pipe. Thus, that is why it is important to utilize CIPP lining. CIPP lining can prevent this example from occurring and can even extend the life of the pipe for decades.